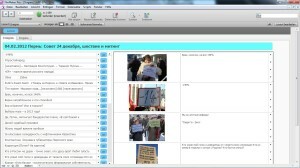 PEPS stands for Protest Events, Photos, and Slogans, and is the name of a novel kind of protest event database. It includes data about the Russian protest wave of 2011-13, which centered on the topic of electoral fraud. As of November 2016, it contains data on 967 protest events from 237 locations, most of them between November 2011 and January 2013, but also including a few election-themed protests from earlier in 2011 and in the period from 2013 to 2016. Rather than solely using media reports, PEPS makes heavy use of eyewitness/participant reports such as blogs and online photo galleries. 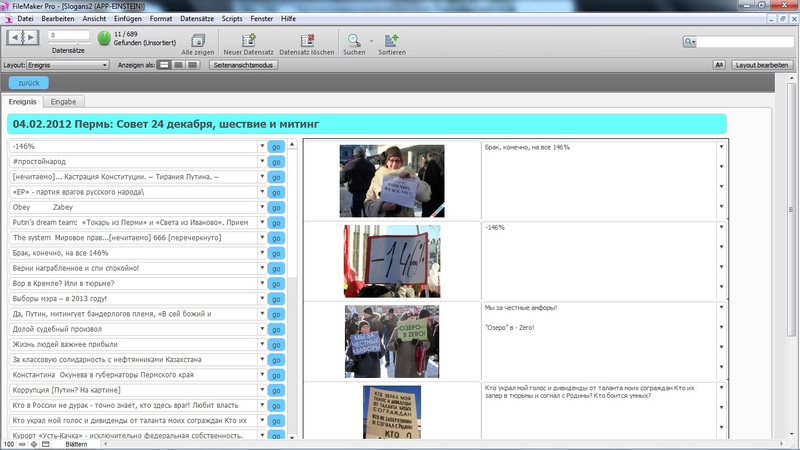 This allows us not only to counterbalance media bias of various sorts (a general problem in reporting on protest events, and one that is especially serious given the political role of the media in nondemocratic states such as Russia), but also to account for diversity among protest participants, thus going beyond protest organizers’ and prominent spokespeople’s representations of the meaning of protest events. PEPS lists every single documented slogan (in particular those displayed on protest signs); in fact the database originally started out as a collection of slogans. This allows us to study the demands and forms of expression of individual protesters at a level of detail unparalleled in quantitative protest event analysis. The inclusion of protest slogans enables us not only to trace the movement’s evolution over time but also to study regional variation and the prevalence of particular topics or types of expression. As of November 2016, PEPS includes 5,380 different slogans. PEPS includes copies of the photographs used as well as local copies of other types of electronic sources (such as news items, blog posts etc), which is especially important given the volatility of Internet sources. This also allows users of the database to consult sources and go beyond codeable variables. Thus the database serves not merely as a basis for data sets that can be used in quantitative analysis, but also as a valuable repository of first-hand reports on individual protest events. PEPS was created by Mischa Gabowitsch at the Einstein Forum in Potsdam/Germany, and is currently maintained by Olga Sveshnikova at the Research Center for East European Studies at Bremen University. Others also participated in data collection at various stages, most notably Manarsha Isaeva (Berlin Social Science Center). (2) two Stata (.dta) files created by Jan Matti Dollbaum, containing event-level data only (no slogans), (a) arranged by individual protest event and (b) aggregated at city level. Mischa Gabowitsch, Protest in Putin’s Russia. Cambridge: Polity Press, 2016. Jan Matti Dollbaum, Reducing protest through elite co-optation? Parliamentary opposition parties and political protest in Russia’s regions. MA thesis, Mainz University (a version of the text was presented to the ECPR Graduate Student Conference, Tartu, July 10-13, 2016). Margarita Zavadskaia and Natal’ia Savelieva, “‘A mozhno ia kak-nibud’ sam vyberu?’: vybory kak ‘lichnoe delo’, protsedurnaia legitimnost’ i mobilizatsiia 2011-2012 godov” [“How about I choose for myself?” Elections as a “personal matter,” procedural legitimacy, and the mobilization of 2011-12], in: M.L. Aliukov, K. Kleman [Karine Clément], A.V. Magun, I.A. Matveev, A.V. Nevskii, N.V. Savel’eva, M.V. Turovets, S.V. Erpyleva, M.A. Zavadskaia, A.A. Zhelnina, O.M. Zhuravlev, Politika apolitichnykh: grazhdanskie dvizheniia v Rossii 2011-2013 godov [The politics of the apolitical: civic movements in Russia, 2011-13]. Moscow: Novoe literaturnoe obozrenie, 2015: 219-268. Artemy Magun, “The Russian protest movement of 2011-2012: a new middle-class populism,” Stasis 2(1)/2014: 160-191.